As a nurse practitioner in the Division of Immunotherapy and Autoimmune Disease at Northwestern Memorial Hospital, Michelle Calvario, MS, APRN-CNP, AGACNP-BC, has a unique perspective to share with her patients and their family members because she has been in their shoes — twice. Calvario’s sister was treated at the Lurie Cancer Center at Northwestern Memorial Hospital for a rare lymphoma and then, months later, her mother was diagnosed with stage three lung cancer. Less than a year after Calvario started working at Northwestern Memorial Hospital, her sister, Kristin Suma, learned that her rare lymphoma returned after three years in remission. Suma had previously undergone chemotherapy where she lives in Northern Virginia, but this time, she required a stem cell transplant along with several months of chemotherapy and radiation. Seeking the best care for her condition, Suma packed up with her husband and two children and moved to Chicago to begin treatment at the Lurie Cancer Center. Suma moved back to Northern Virginia in July 2018 and is now two years cancer-free. Just a few months after Suma’s stem cell transplant, cancer struck Calvario’s family again. Her mother, Marilou Calvario, a non-smoker and a nurse with 43 years of experience, was diagnosed with stage three lung cancer. Again, the family turned to Northwestern Memorial Hospital. “Like a true nurse, she handled her nine rounds of chemotherapy and 30 treatments of radiation with grit and grace,” Calvario says. Her mother is still undergoing immunotherapy treatments every two weeks, but feeling strong. 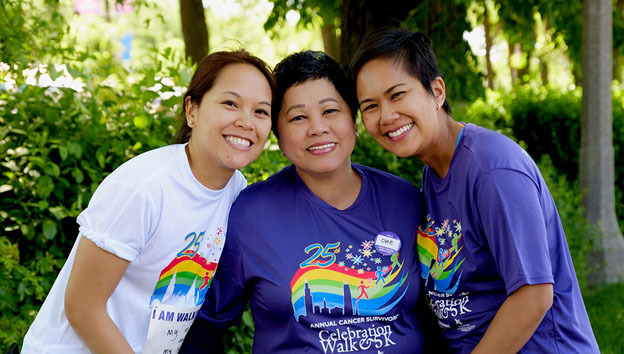 On June 3, 2018, Calvario participated in the Robert H. Lurie Comprehensive Cancer Center of Northwestern University Cancer Survivors' Celebration Walk & 5K alongside her mother and sister. The day was a combination of pride and thankfulness, and Calvario was awestruck at the strength of her mother and sister. As Calvario reflects on her family’s cancer journey, from oncology appointments, billing and medical records phone calls, outpatient chemotherapy and immunotherapy, all the way to watching both her mother and sister ring the gong in Radiation Oncology signifying their last radiation treatments, she cannot help but feel grateful.